The movie "The Wife" opens with a phone call. JONATHAN PRYCE: (As Joe Castleman) Hello. JAN MYBRAND: (As Arvid Engdahl) Am I speaking to Mr. Castleman? PRYCE: (As Joe Castleman) I'd like my wife to get on the extension. CORNISH: A husband and wife rush out of bed to pick up the phone in different rooms. GLENN CLOSE: (As Joan Castleman) Hello. I'm on. MYBRAND: (As Arvid Engdahl) It is my great honor to tell you, Mr. Castleman, that you have been chosen to receive the Nobel Prize in literature. PRYCE: (As Joe Castleman) Tell me this isn't some great joke. CLOSE: (As Joan Castleman) It's all real, darling. CLOSE: (As Joan Castleman) Breathe. CORNISH: The husband is euphoric. The wife's face reveals something very different. Glenn Close, playing Joan Castleman, conveys a lifetime of buried secrets. And here's your spoiler alert if you need one. For decades, she's been doing more than proofreading her husband's books. CLOSE: The shock of hearing that her work had been awarded the Nobel Prize is what she's dealing with then. 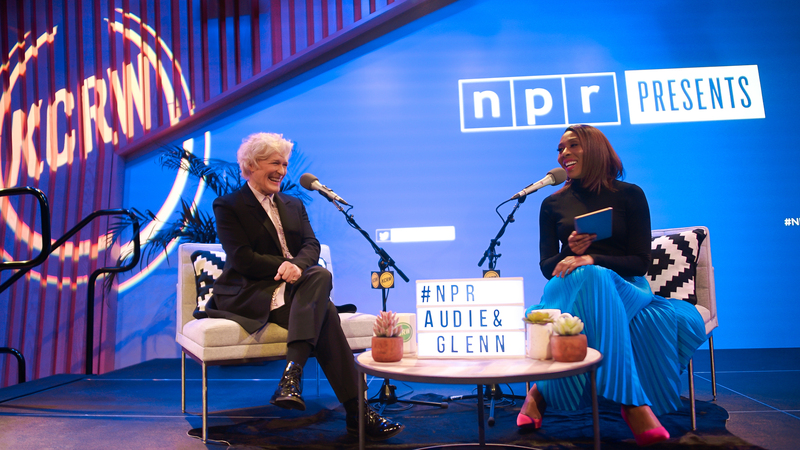 CORNISH: That's Glenn Close speaking to me in front of an audience last week at KCRW in Santa Monica, Calif.
Close has already won an armful of awards for her performance in "The Wife." Now she's a frontrunner for an Oscar. That's her seventh nomination. And throughout that career, she's become a master of the kind of shot that opens "The Wife" - the close-up. CLOSE: Film is the only art form that has the close-up. And the close-up, when you think about it, is the human face showing emotion. And I've learned over the years that the close-up well done is what keeps the audience emotionally involved because you become the person that I'm looking into your eyes. And there's nothing more powerful than that. CORNISH: How and when did you learn to trust your face, (laughter) you know, trust the director? Was there a film or a moment earlier in your career when you thought, oh, OK, this is - you had an aha moment about that kind of work? CLOSE: I started actually realizing about it in "The Big Chill," actually, which was my second film. And it was in the scene where I am talking to JoBeth Williams' character about the affair that I had had with the man who had just committed suicide. And I realized during that scene that what was not being said was powerful, and silence was powerful and that film is so intimate in moments like that, that you can - you can trust them. 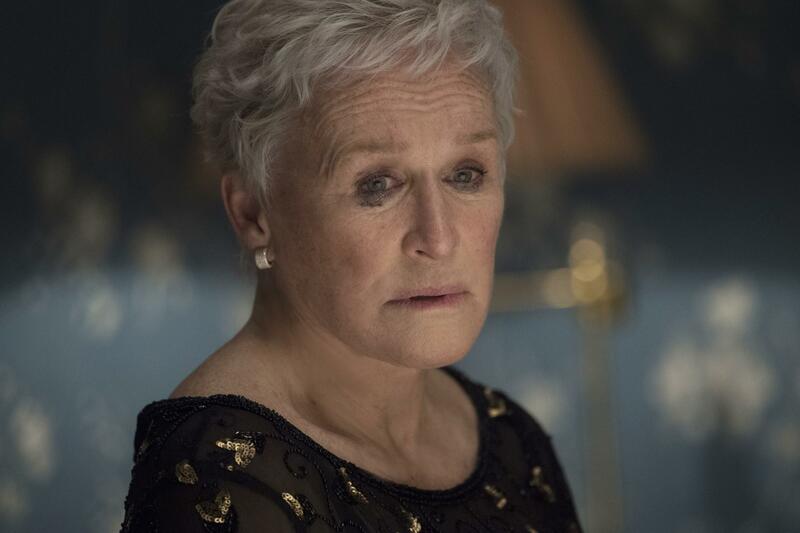 CORNISH: Glenn Close's new film has gotten a lot of attention because of her performance but also because of its subject matter - the story of a woman whose contributions are overshadowed by a powerful man, played in the film by Jonathan Pryce. It resonates with audiences in this moment. And the screenwriter for "The Wife" said it took 14 years to get the movie made, in part because no male American star would accept second billing to a woman, which frankly stunned me. CLOSE: Think about it. Actors - star actors have big egos that nobody wanted to be in a film called "The Wife." CORNISH: ...Is 'cause there's - because of this current conversation about pay equity in Hollywood - right? - and this conversation about what can men and women do to change the disparities, it seems like these are the exact moments when a man could step up and be helpful. (Laughter). CORNISH: And I'm wondering what you think are the forces there that prevent people from doing that. CLOSE: Prevent men from doing it? CLOSE: But that's the thankless part of the film. Here I am, with all this acclaim, and he has not gotten anything out of it. And - and I think that was the risk of that part. But if you - if you've seen the movie, he is [expletive] brilliant. CORNISH: But you can say that about so many women costars in so many movies, right? CLOSE: ...For what he did, and he's my date. CORNISH: You've picked up several awards this year so far, and of course the one people talked about a lot was the Golden Globes, in part because of your speech. CLOSE: I'm thinking of my mom who really sublimated herself to my father her whole life. And in her 80s, she said to me, I feel like I haven't accomplished anything. And it was so not right. And I feel what I've learned through this whole experience is that, you know, women, we're - we're nurturers. That's what's expected of us. We have our children. We have our husbands, if we're lucky enough, and our partners - whoever. But we have to find personal fulfillment. We have to fill out - you know, our dreams. CLOSE: We have to say, I can do that. And I should be allowed to do that. CORNISH: So you've had some time now to enjoy this kind of response every - 'cause this went viral. You still look surprised. CLOSE: I didn't think I was going to win. I thought Lady Gaga was going to win. CLOSE: And I had, you know, for my own kind of emotional survival - had convinced myself of that. So that was totally spontaneous. CORNISH: 'Cause you also don't talk that much about your personal life. So even to hear you reference your mother - and you grew up in Connecticut, and your father was a surgeon and a very powerful figure. Was that a revealing moment to make the connection to the film even? CLOSE: I've never gotten over the fact that, in her late 80s, she said, I feel I've accomplished nothing. CORNISH: What was she like? CLOSE: She was a great woman. She never finished high school. She and my dad got married when they were 18. He went into the Army Air Corps and into the Second World War. She wanted to have a family. He came back and went into Columbia Medical School. And basically from that moment on, she was the major child-rearer. And I think my dad, he has his own story. He was sent - he and his twin brother were sent to an English boarding school when they were 7 years old. And I think for my father and for his sensitivity, it was the wrong thing for him. I think, for him, it was abandonment. He was trying to make himself worthy of love for the rest of his life. And that's why in the movie, it was one of the hardest scenes for me to film. I've told my husband I'm going to leave him. He has a heart attack. And he says, do you love me? And I stopped this shooting. I said, does he have to ask me that? CLOSE: That's so unfair. But when I think about it, I think he's never thought of himself as worthy of love. CORNISH: You've been someone who's never been afraid to move between TV, film, stage. Is there a place where you feel most at home? CLOSE: Probably the stage because, I mean, to me, that's like the essence of - of the craft. And if you can't hold an audience from the stage, you've lost something in your craft. I just finished - I did 14 weeks at The Public Theater in New York, played Joan of Arc's mother. And that was - oh, my, God. Every night, having to bathe my daughter to be taken off to the stake. It was exhausting but thrilling because it was an intimate theater. The audience was this close, and you can't fool anybody. You got to come up with the goods eight times a week. And, you know, you get back there, and I thought, well, I still got it. I still can do it. CLOSE: Got to check up every now and then. CORNISH: Glenn Close, still got it. You can catch her in the film "The Wife." We spoke to her for our series NPR Presents at the Annenberg Performance Studio at KCRW in Santa Monica. (SOUNDBITE OF FETE'S "THE ISLANDS") Transcript provided by NPR, Copyright NPR.